PowerForward offers labeling equipment for producing and attaching health & safety info or promotional items. Our Booklet Label Machine attaches ECLs or marketing materials to high speed label webs. It feeds booklets, foldout coupons, product samples or game pieces, and places them accurately on your label web ... while running reliably at press speeds. If you're new to booklet label manufacturing, see our Success Tips. Plus our PowerStick applicator applies booklet labels (as well as other pressure-sensitive items) in line on high speed web processes. 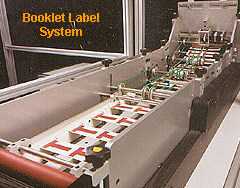 The Booklet Machine performs a key operation in the manufacture of booklet labels. It places the individual printed booklet items precisely on your web where they need to be for laminating and then die-cutting (it puts the "ham in the sandwich"). This high-speed, industrial machine runs reliably on your press or other web mover. To enhance productivity, booklets may be printed 1, 2, 3 or 4 up - whatever fits the width of the machine's feeder. Two models are available to meet your production needs depending on the weidth of your label press. See our recommended Success Tips.